As noted in Wed’s analysis, focus on response to Wed’s Breakout Area/Low Usage Support, 56.80s-57.40s was key in Thu’s auction as selling interest drove price lower achieving a Stopping Point, 55.30s, near the Wed Buy Program Support, ultimately creating an unsecured low near 54.28s. 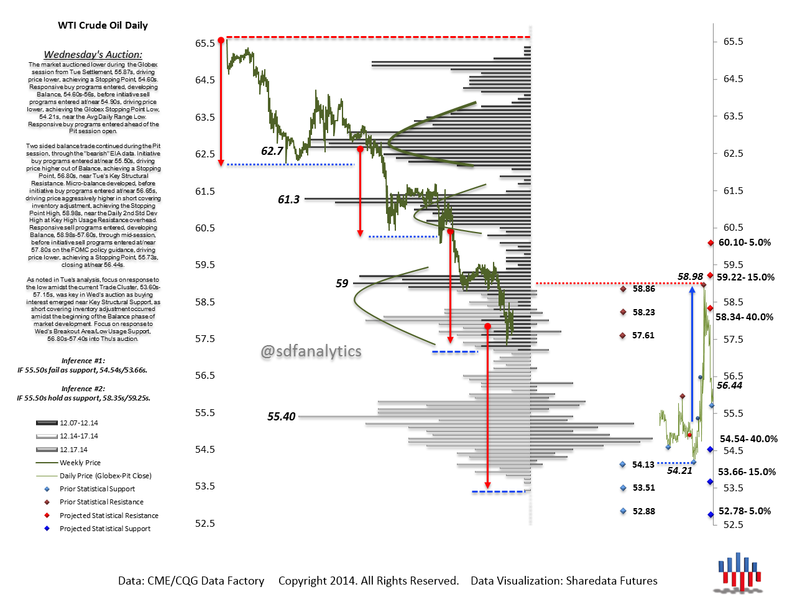 Focus on response to Thu’s trade cluster, 53.50s-56.50s, into Fri’s auction. Noted here during Thursday’s auction, the development of the Structural Selling Tail, 58s-57.50s, implying the potential for price discovery lower. Initiative sell programs then entered, 56.30s-56.25s, and noted were the downside expectations, 55.20s, and the Average Daily Range Low, 54.54s, which was ultimately achieved into the NY close. 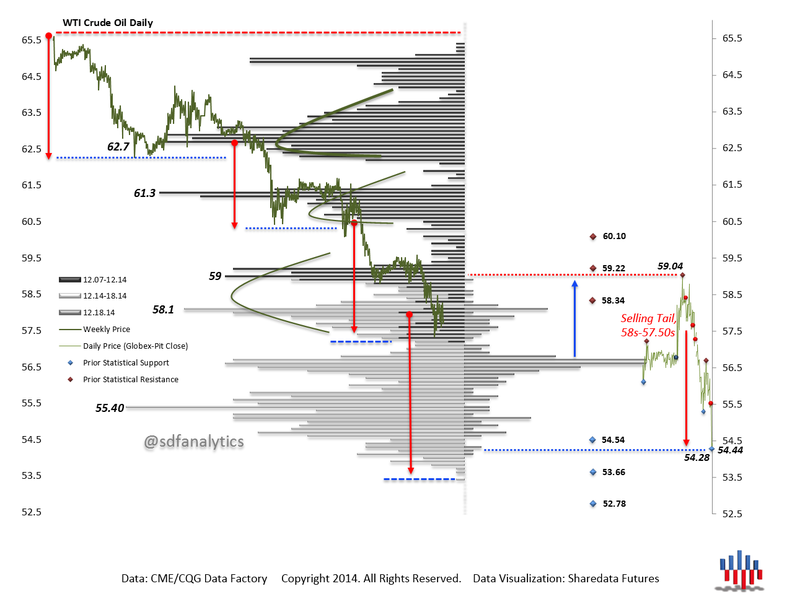 As noted in Mon’s analysis, focus on response to the unsecured low area, 55s-56s, was key in Tue’s auction as selling interest emerged at/near 55.55s, driving price lower, achieving the Stopping Point Low, 53.60s, near the Daily 1st Std Dev Low. Despite the Gap Lower open, responsive buying interest emerged in aggressive short covering inventory, filling the Gap. A Structural Stopping Point Low, 53.60s, is potentially in place. 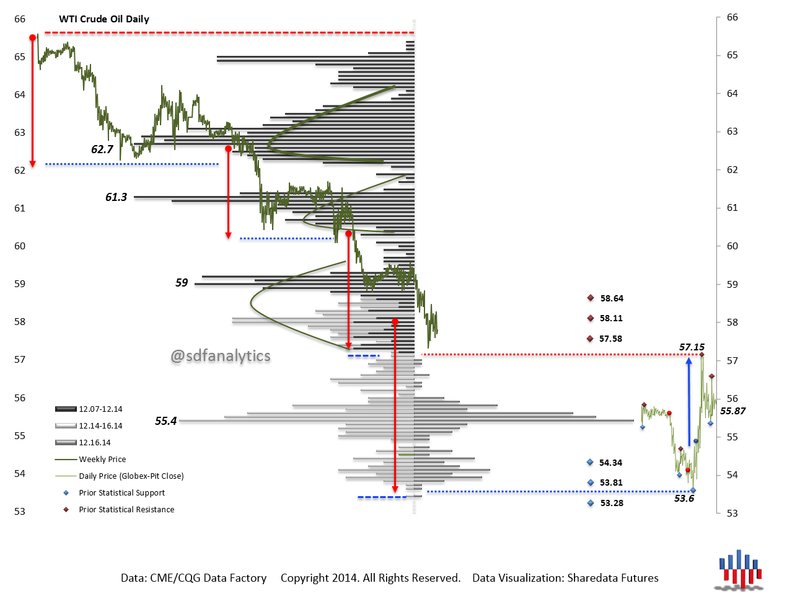 Focus on response to the low amidst the current Trade Cluster, 53.60s-57.15s, into Wed’s auction. Noted here during Tuesday’s auction, that the market had achieved the Daily 1st Std Dev Low and based on current market generated data on a rolling 20day basis, there was an 85% probability that level hold as support, provided buying interest emerged there. 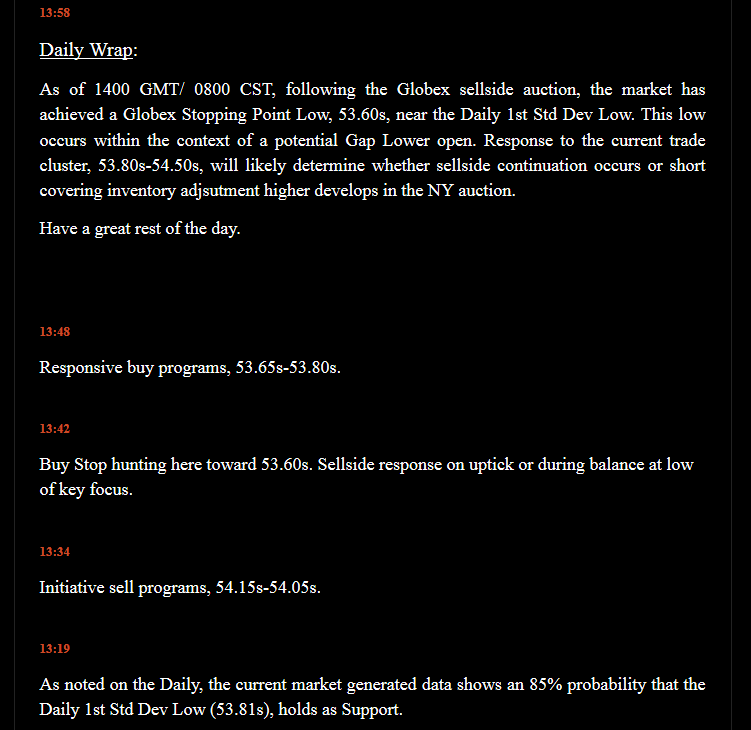 Following clearing of Buy Stops below the Globex Low, responsive buy programs were noted, driving price higher toward our upside expectation, 56.40s (Mon’s HVN)/ 57.58s (Tue’s Avg Daily Range High). Sharedata Futures, Inc. provides historical data mining and visualization for the benchmark NYMEX Energy Futures Markets. Sharedata combines structural analysis of the market generated data, dynamic systems analysis, and Bayesian causal inference techniques favored by the scientific and intelligence communities to provide a robust framework for addressing the uncertainty and risk in energy pricing. Harness the power of historical data mining and dynamic systems analysis to inform your risk management. 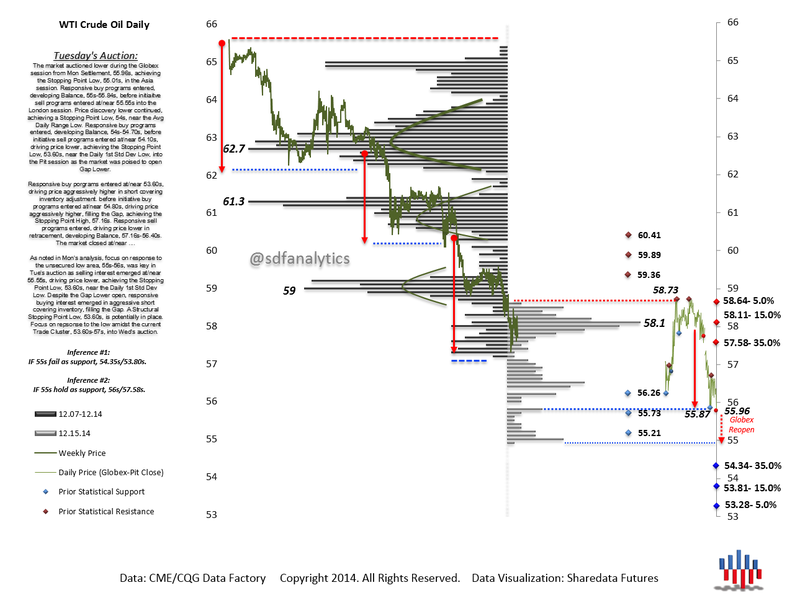 WTI Weekly: Balance Development Continues Under Key Stopping Point High, 64.79s. NG Weekly: Break Of Key Support To 2.48s Near 2-Year Lows. XLE Weekly: Balance Develops Below 2019 Highs. XLF Weekly: Minor Pullback Early Week To 26.91s Before Minor Price Discovery Higher To 27.46s. XLK Weekly: Price Discovery Higher To 77.84s, A New All-Time High. XLU Weekly: Failed Probe Of Key Resistance Early Week, Price Discovery Lowe To 57.21s.